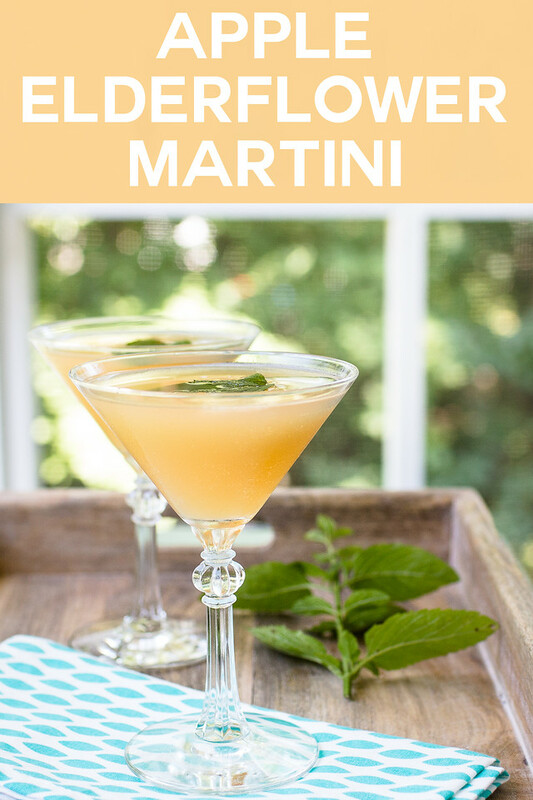 This Apple Elderflower Martini is the perfect transition from summer to fall cocktail! A hint of floral from the elderflower liqueur and the sweetness of fall apples. Well, it’s back to school time already. Remember when back to school meant after labor day? Now, it’s the first of August. Since fall is my favorite season, I’m not really complaining. I’m ready. Bring on the pumpkin and the apples. Speaking of apples, you are going to love this Apple Elderflower Martini. It is the perfect summer to fall cocktail. Floral notes from the elderflower liqueur and sweet fruitiness from the apple juice and a little vodka to let all the flavors shine through. If you’re not quite ready to say goodbye to summer, this Blueberry Elderflower Martini is perfect! While it’s well known that I am a gin girl, vodka cocktails do have their place in my heart. Like this cocktail. Since vodka doesn’t assert itself like gin does, it lets the flavor of whatever you are mixing with it shine through. Since we wanted the apple and the elderflower flavors to be present, vodka was the perfect choice. Speaking of vodka, if you haven’t been to a liquor store lately, go check out the vodka shelf. Or should I say the vodka aisle? Because there are a zillion vodkas. Personally I plan on working my way down the aisle. The best part of this apple martini? Besides the fact that it’s super delicious? It’s so easy and it makes a pitcher, perfect for your next party. Looking for something a little more elegant for your game day get togethers? Pour vodka, apple juice and elderflower liqueur into a pitcher. Strain into 4 martini glasses and garnish with cucumber slices and mint leaves. Enjoy and contemplate making your next pitcher. I found this recipe in Donna Hay’s magazine issue #66. If you are looking more cocktail recipes, these are few of my favorite cocktail books: The 12 Bottle Bar and Shake: A New Perspective on Cocktails. 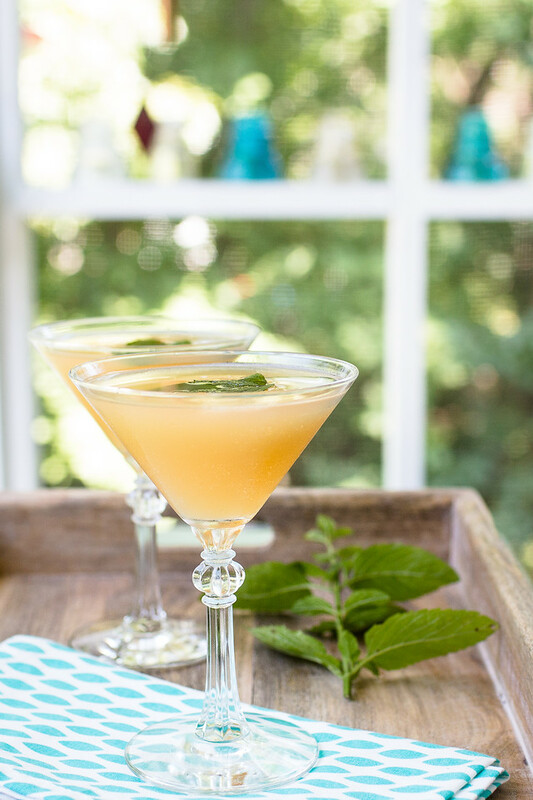 This Apple Elderflower Martini is the perfect summer to fall cocktail! 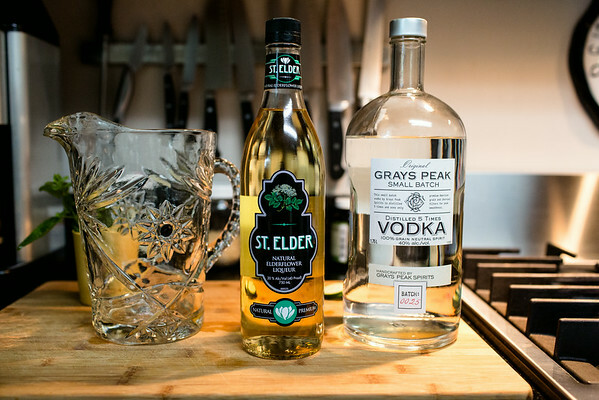 Combine the vodka, apple juice and elderflower liqueur in a pitcher. Add crushed ice and stir to chill. Strain into 4 martini glasses. Garnish with a cucumber slice and mint leaves. What beautiful summer flavours there are in this elegant drink! Thank you so much for bringing this lovely cocktail recipe to the Hearth and Soul Link Party, Pam. Sharing on my blog page. Hope your week is going well! I am loving the drink ingredients you paired together. I can’t wait to try. One of my favorite things about Fall is that everything is apples! I adore the variety of apples in fall and love how you have incorporated them into this martini. I’m so ready for fall and apples! Wow, this looks absolutely delicious. For our next party I’ll definitely be mixing this up for our guests. Thank you. Is it five o’clock yet?? This is an amazing martini!